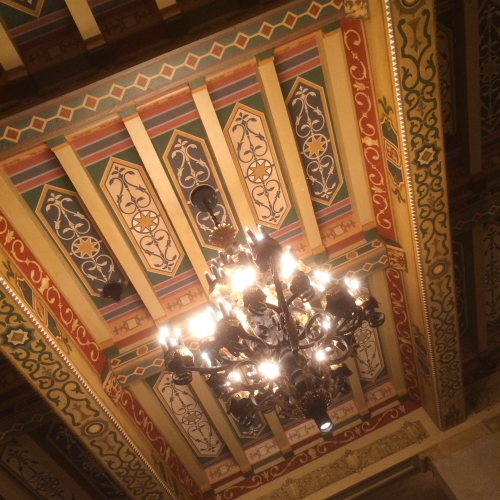 The lobby of the Roosevelt, as is true for many a grand old hotel, is a great place for a happy hour drink. Built in 1927 in the Spanish Colonial Revival style, it is ornate and atmospheric and mysterious. We would have lingered, but our stomachs had other ideas, so we headed to West Hollywood to check out Night + Market, a trendy Thai street food restaurant. (Incidentally, it was there that I got the idea for this blog.) To his credit, T was a great sport about driving me around to try places that had been recommended by my Detroit friends, and I was thankful for that because this was easily the best Thai food I’ve ever put in my mouth. The legendary Rainbow was just up the block, so we popped in after dinner for a cocktail and some hair metal. T regaled me with stories about famous past patrons and I soaked in the ambiance of former glory days. 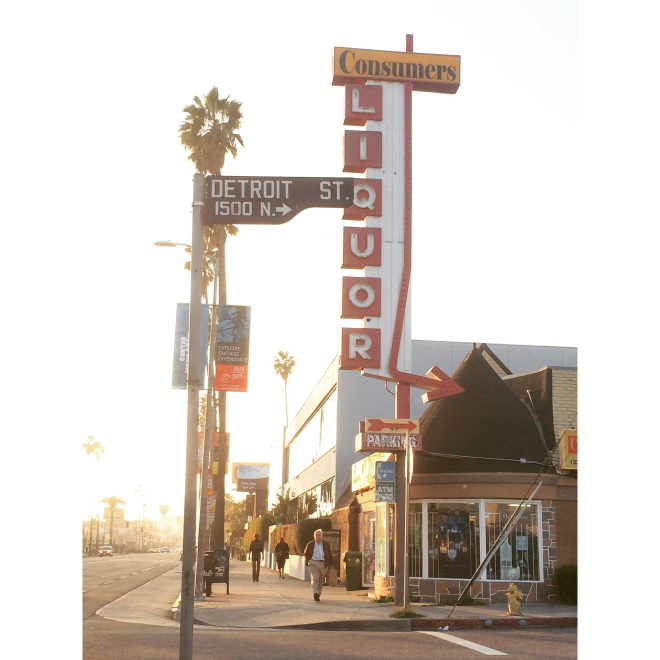 There’s something to be said for the history of a place, but sometimes it’s better to make your own, so we moved on. 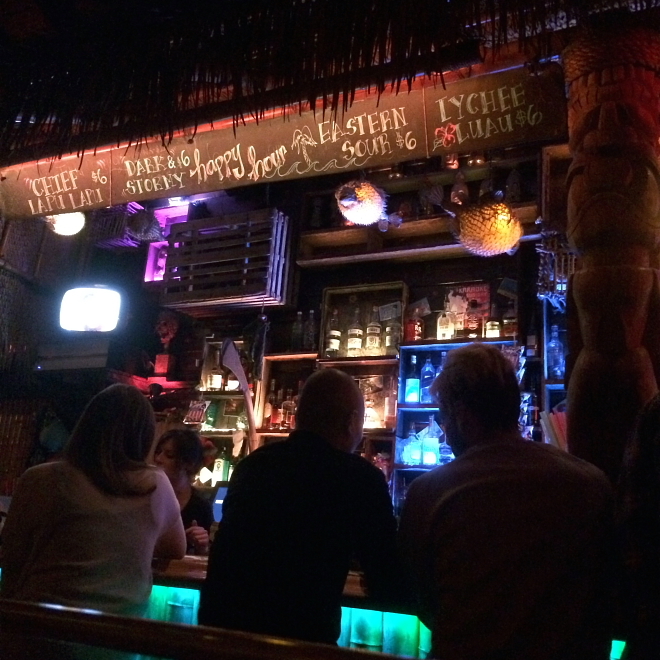 We wound our way back to North Hollywood and into Tiki No, just a few blocks from T’s house. The drinks were so delicious (and relatively inexpensive) that we had to try more than one… why not three? As the night wore on and inhibitions were shed, we trekked down memory lane to our post-college days. Didn’t I know that T had had a crush on me all those years? All the times I visited him in Chicago? No, zero clue. I tend not to assume anyone has feelings for me unless they are clearly stating it outright… and even then, I usually have my doubts as to how real or sincere it is. I mean, I had gotten texts from the ukelele picker expressing various degrees of enamoredness for the last 2 months, but I knew better than to take them too seriously, much as I might want to. A healthy degree of romantic pessimism is all but required with a disposition like mine; a part of you that constantly tamps down hope and desire (we could also call this “managing expectations”) in order to maintain a liveable equilibrium. Not only did poor T confess an unreciprocated crush, but he inadvertently pushed one of my buttons that provoked instant tears in my tiki-sodden state. I’ll spare details, but it had to do with my family and adjusting to my new reality as a single person. Let me just say, there are a lot of great things about my life right now, and every single day I embrace it more and more. But I’m still in the adjustment stage, and there are still raw nerves. Luckily I was able to recover fairly quickly and laugh off the incident as a byproduct of the night’s imbibing. We went back to the tiki bar a few nights later but, such is life, it wasn’t the same. Likewise, when I got home from my trip, it just so happened that ukelele man’s attentions seemed to drop off suddenly. Perhaps a karmic payback for affections I had not returned to T? Whatever the case, I’ll try my best to get back to my old M.O. of squelching any unruly feelings… unless perhaps a few coconut mojitos are involved.